Operating any business is complex and challenging, but it provides interesting, creative, and rewarding experiences. 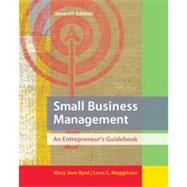 Small Business Management, Seventh Edition, takes a practical and down-to-earth approach to planning, organizing, and running a small business. While employing current research and theory, Small Business Managementtakes a pragmatic "how-to" perspective illustrating many practical examples and applications from the business world. It explains how to achieve optimum benefits from the limited resources available to small firms, as well as how to plan for growth and succession in a business. It also explores arguments both for and against owning a small business. The enhancements to the seventh edition serve to strengthen and reinforce without minimizing or losing the original qualities and usefulness of the textbook. The business plan remains a very important building block for this edition in both examples and format.